Location of microinjection cannula tips in the Acb in experiment 1. The placements represented are from all rats included in the final analysis. Atlas templates were adapted from Paxinos and Watson (1998) (distances in millimeters from bregma). 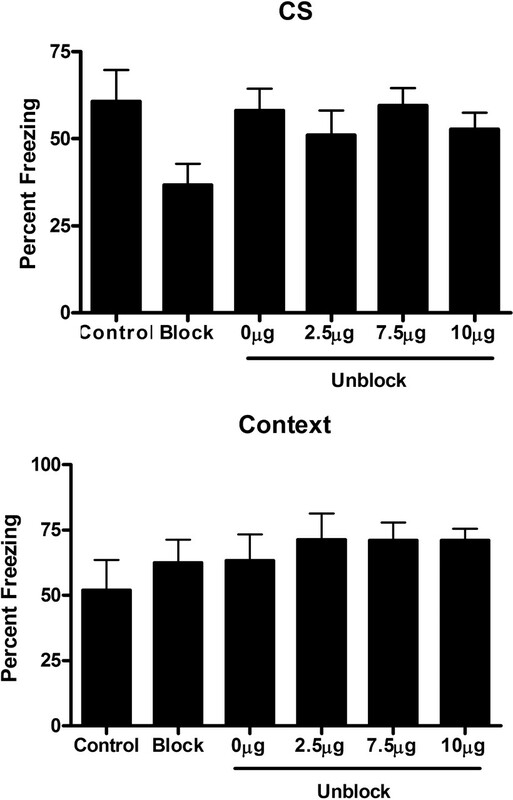 Mean (±SEM) levels of freezing in experiment 1. The behavioral design is shown in Table 1. Top, Freezing to the auditory CS. Bottom, Freezing to the context. There was evidence for blocking of CS fear learning and prevention of blocking by morphine. 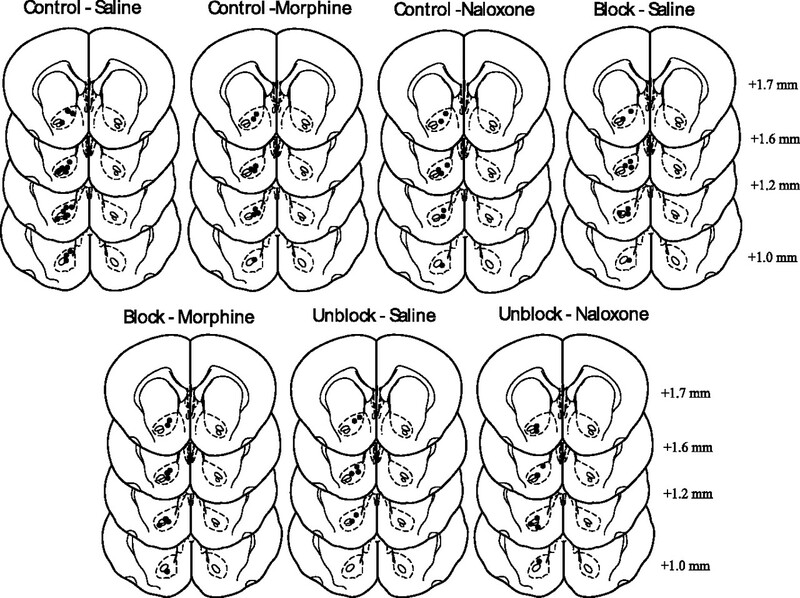 There was evidence for the unblocking of CS fear and the prevention of unblocking by naloxone. Sal, Saline; Mor, morphine; Nal, naloxone. Location of microinjection cannula tips in the Acb in experiment 2. The placements represented are from all rats included in the final analysis. Atlas templates were adapted from Paxinos and Watson (1998) (distances in millimeters from bregma). Mean (±SEM) levels of freezing in experiment 2. The behavioral design is shown in Table 1. Top, Freezing to the auditory CS. Bottom, Freezing to the context. Acb microinjection of morphine before the first or before both stage II trials prevented blocking, whereas microinjections before the second stage II trial did not affect blocking. Location of microinjection cannula tips in the Acb in experiment 3a. The placements represented are from all rats included in the final analysis. Atlas templates were adapted from Paxinos and Watson (1998) (distances in millimeters from bregma). Mean (±SEM) levels of freezing in experiment 3a. The behavioral design is shown in Table 1. Top, Freezing to the auditory CS. Bottom, Freezing to the context. There was evidence for blocking of CS fear learning and prevention of blocking by the μ-opioid receptor agonist DAMGO but not the δ agonist DPDPE. 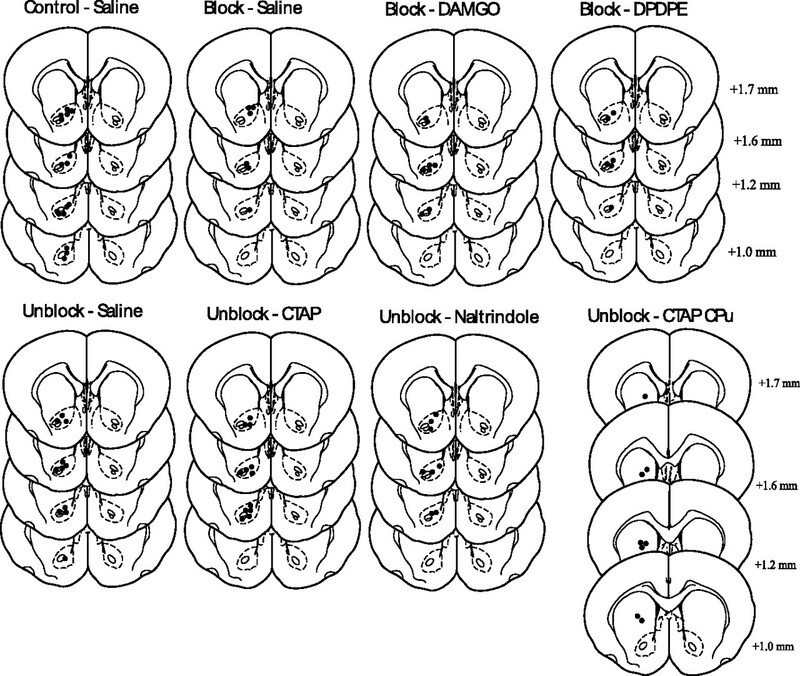 There was evidence for the unblocking of CS fear and the prevention of unblocking by the μ-opioid receptor antagonist CTAP but not the δ agonist Naltrindole. Ctrl, Control; Sal, saline; Nalt, Naltrindole. Location of microinjection cannula tips in the Acb in experiment 3b. The placements represented are from all rats included in the final analysis. Atlas templates were adapted from Paxinos and Watson (1998) (distances in millimeters from bregma). 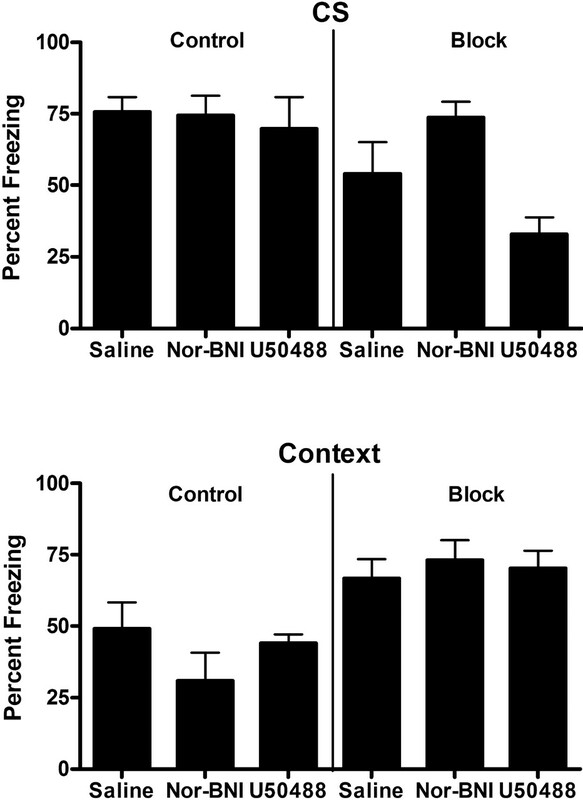 Mean (±SEM) levels of freezing in experiment 3b. The behavioral design is shown in Table 1. Top, Freezing to the auditory CS. Bottom, Freezing to the context. There was evidence for blocking of CS fear learning and for unblocking. 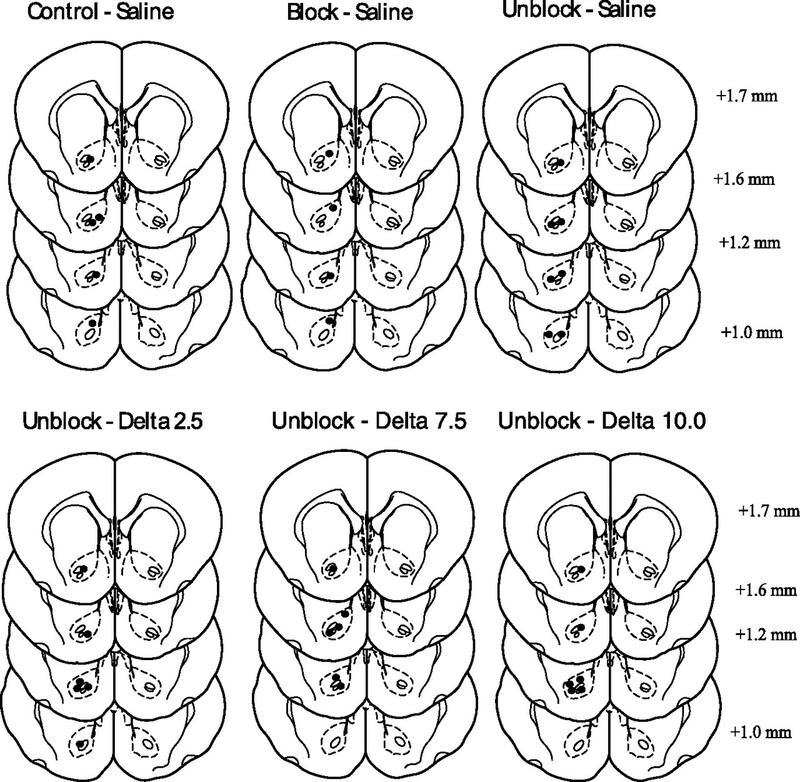 The Acb infusions of the δ agonist Naltrindole had no effect on unblocking of CS fear conditioning. Location of microinjection cannula tips in the Acb in experiment 4. The placements represented are from all rats included in the final analysis. Atlas templates were adapted from Paxinos and Watson (1998) (distances in millimeters from bregma). Mean (±SEM) levels of freezing in experiment 4. The behavioral design is shown in Table 1. Top, Freezing to the auditory CS. Bottom, Freezing to the context. 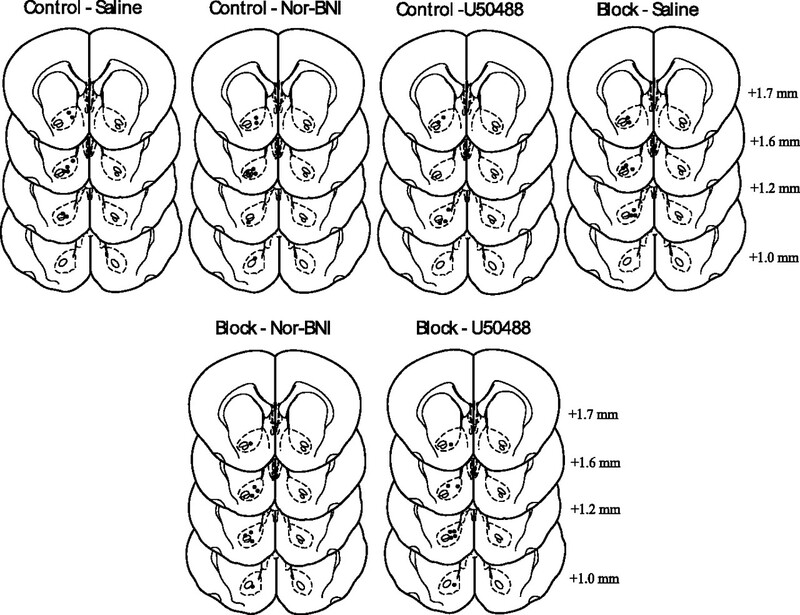 There was evidence for blocking of CS fear learning and the facilitation of blocking by the κ-agonist U50488. Cxt, Context; +++, +++, three footshocks.